Thursday morning, 9:50 a.m. 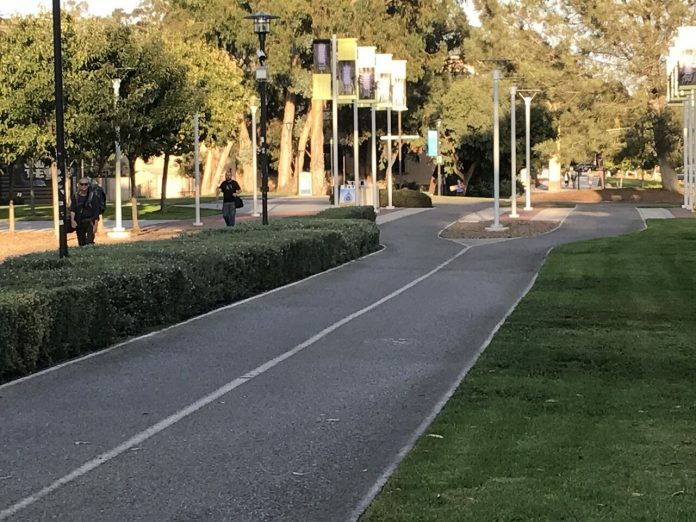 Most UCSB students know this is the worst time to leave for class. On a typical day, bikers and skateboarders zip through the crowded campus paths during peak rush hour. Contrast this hectic morning environment to that of summer sessions: bikers cruise sleepily down an unusually deserted Pardall Tunnel. Vacant streets and warm air render all those who stay in Isla Vista during summer calm and serene. Although their lives continue to be filled with the bustle of work and class, students and professors alike feel the difference in atmosphere during the summer months. Most students you talk to who have taken summer classes will rave about the smaller class sizes. Professors are less busy and less stressed, leading to more laid-back lectures where they can actually learn your name. Jenna Gavigan, a fourth year environmental studies major, says “It’s always easier to go to a professor’s office hours when they already know your name.” This reflects many students’ feelings that although it’s never anyone’s dream to take summer classes, it can be a great idea if you’re retaking a difficult course or think you will need more individual help in the class. Jake (last name undisclosed), a third year English major, explained that students feel “like professors are more helpful and want to be there for you, and less like you’re just one in a swarm of students.” Friendships are more easily made in class, and with a more relaxed professor, lectures become more stimulating and — dare I say — fun. If you tell your friends you’re taking twelve units, you’ll most often be met with a groan and a “good luck, my friend.” The accelerated pace makes every unit more intense and twelve units ends up feeling like twice as many. But in return for your hard work, you get a class with less unnecessary fluff and more engaging lectures. Director of Summer Sessions Blake Nemelka and associate director James Ford have seen that students who come to summer session early on in their college careers are more likely to graduate on time. They report that of the 8,500 students enrolled in summer session, about 80 percent are using their time to get ahead in their studies. Summer sessions also give students time to strategically plan their college careers and make time for internships or study abroad. Ford notes that “UCSB has a lot of double majors and there is an increasing number of people who are picking up minors,” which makes summer session even more valuable to those who are trying to graduate in four years. Nemelka strongly encourages students to graduate as early as possible. The average bachelor’s degree holding student makes around $50,000 out of college, so graduating and starting a high-paying job can be better financially than taking the summers off and getting a low-paying summer job. There are over six hundred courses offered during the summer, including fifteen online courses. At other schools, summer classes may be easier, but here at UCSB, that is not the case. Nemelka and Ford emphasized that they are very careful to ensure that the “academic rigor and content are no different” from the regular school year courses. The rigor of summer courses is reflected in students’ grades during summer. Nemelka explained that there is “no statistical significance of GPA differences from classes in the summer and classes in the other quarters, overall,” according to Steven Velasco, the Director of Institutional Research, Planning, and Assessment. Although some students may dislike summer session, students who take summer session once are highly likely to do it again. Although the number of students on campus drops significantly — only 38 percent of students take summer classes — there are still many opportunities for cultural enrichment and community activities: “Arts and Lectures is still active and shows films, we run the cultural enrichment grants which fund students groups to bring a speaker to campus and set up plays, music festivals, and other events for cultural enrichment,” said Ford.